“I used to believe that timing was everything. 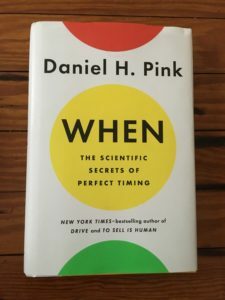 Now I believe that everything is timing,” Daniel Pink writes poignantly at the end of his new bestseller, When: The Scientific Secrets of Perfect Timing. 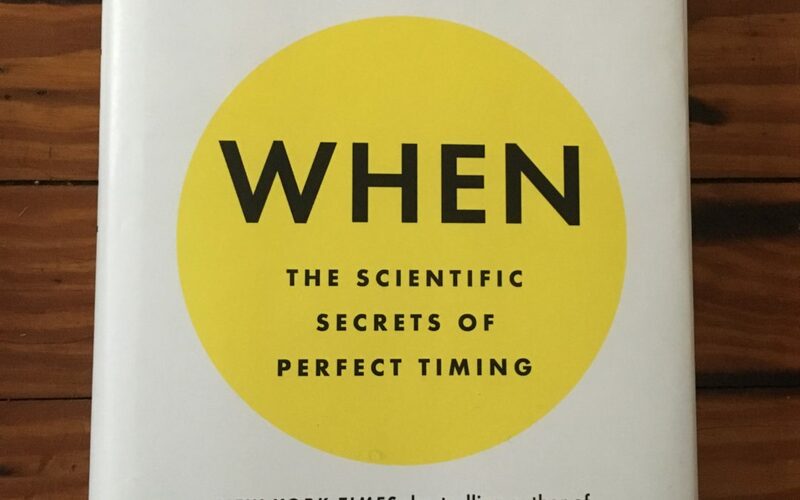 In his engaging, easy-to-read, evidence-based book, Dan shares what he learned about the science of timing. By analyzing recent research from the fields of neuroscience, economics, psychology and biology and synthesizing it for us in one place, he’s providing an incredibly useful public service. Now back to the subject of timing. We think and talk incessantly about time. “Time” is one of our most commonly used words in English. We surround ourselves with clocks. And we worry about time. Yet, on a daily basis we don’t act as intentionally about timing as we should, which comes through loud and clear in the book When. And as the scientific evidence shows, by not paying as close attention to “when,” we can impede our progress and overall performance, especially at work. Plus we can put our health and other aspects of our well-being at risk. In Chapter One, “The Hidden Pattern of Everyday Life,” Dan writes about how the daily rhythms of humans all across the globe follow a predictable cycle. We have a peak, a trough, and a rebound during which our moods and performance oscillate. By knowing your type, you can better apply the science to plan your day. If you can match your tasks with the ideal degree of mental alertness and physical energy you need for them, you can get more done well with ease. For example, during your peak period, you’re better at doing analytic work. You can focus better and you’re more detail oriented. The peak period is also good for making first impressions and making decisions. When you get your rebound, you’re more inclined to excel at thinking creatively, including looking at things in new ways and getting insights. As for the trough, try to hold off on doing challenging work then. Even better, use the time to take restorative breaks, which help you strengthen your resolve and your later performance. And if you’re not sure what constitutes a good break (yes, there’s science that supports breaks), check out the book’s five kinds of restorative breaks. If you’re trough time is in the afternoon, also try to avoid scheduling outpatient surgical procedures or even doctors’ visits. The afternoon circadian lows that make you a bit groggy also can impair the vigilance of health care professionals. Based on the research, my preference is to schedule morning doctors’ appointments as well as morning meetings for work when people are fresh and at their peak. Yes, the morning hours are crammed…. Putting all of these science-based tips into practice isn’t always practical though, especially if you’re working on or with a global team and having to deal with multiple time zones. Then add to that all the scheduling and rescheduling challenges due to team members’ other commitments. For example, soon I’ll be conducting a live webinar training session during my peak time on a Friday morning but the trough time for the team members based in Switzerland. It will be the rebound time for the team members in India, but probably not exactly how they want to spend their Friday night…. At least I’m even more aware of the perils of this time slot and at a minimum can try to improve the experience for everyone. Knowing “when to” in addition to “how to” and “why” gives your mood and performance a boost. Are you ready to read this great new book and pay more attention to “when”? I'm always confident that she will deliver. Also, whenever she offers up cultural advice for the company, Liz hits the mark. With Liz, I know things will be done and done the right way."